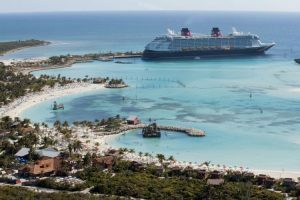 You are here: Home » Blog » Blog » Cruise News » Three New Ships Joining the Disney Cruise Line Fleet! Three New Ships Joining the Disney Cruise Line Fleet! We have known for a while now that Disney Cruise Line was expanding their fleet! A while back Disney officials made the announcement that not one, not two, but THREE new ships would be joining the impressive lineup of ships in the Disney Cruise Line fleet! 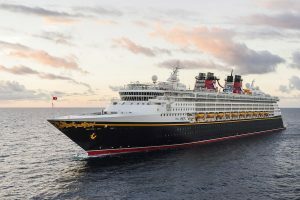 The Three new ships will be joining the Disney Cruise Line family alongside the four ships Disney currently has, the Disney Magic, Disney Wonder, Disney Dream and Disney Fantasy. Disney has taken cruising to the next level in the cruise industry. Anyone I have spoken to that has been on many cruises with other cruise lines and then takes a Disney cruise all say the same thing which is “once you go on a Disney Cruise you will never want to go back to other cruise lines”. Disney knows how to spoil you! The rooms are larger and very elegant, the food and restaurants are wonderful, the entertainment is fantastic and the Disney staff is as always, the best of the best. These ships have something for everyone. Disney knows how to make a family vacation perfect with things to do for all age levels but Disney equally knows how to make a romantic couples cruise where you will not even know that there are children around having areas for adults only to dine, relax and be entertained. Now we can look forward to more of this Disney cruise magic coming in the near future. Officials at Port Canaveral met this past week regarding the new fleet of Disney cruise ships which will be docking in Central Florida. Port Canaveral will be getting some major upgrades to accommodate the three new ships by Disney. The information we learned says the ships will roll out in 2021, 2022 and 2023. Each of these ships will hold at least 1250 staterooms. One of these ships will be 1,119 feet long which will make it Disney’s longest ship!! As soon as we start hearing more updates on the progress of this new line of ships we will be sure to bring this information to you in future blogs. Until then maybe it is time to begin planning your Disney cruise on one of their current ships. 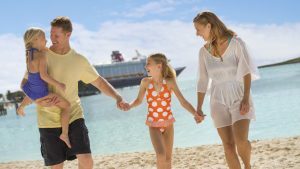 Just contact a Kingdom Magic vacations travel planner to get started on making your Disney Cruise dreams come true! This entry was posted in Cruise News, Cruises, Disney Cruise Line and tagged disney, disney cruise, Disney Cruise Line, disney parks, disney world on January 25, 2019 by Megan Przychodzien.